Over the past few days, we've gotten our first look at iconic Harry Potter characters as played by new actors in the upcoming stage play Harry Potter and the Cursed Child, which the first audiences will get to see in previews starting June 7. Back in February, the full cast was announced, but aside from the main trio of Jamie Parker (Harry Potter), Noma Dumezweni (Hermione Granger) and Paul Thornley (Ron Weasley), it was never confirmed who the other cast members are playing, until these reveals started earlier this week. 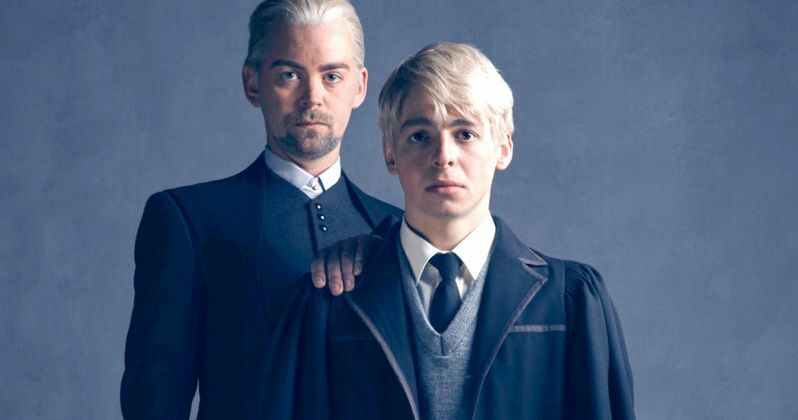 Today we have the third and final batch of photos and character reveals which feature Alex Price as Draco Malfoy and Anthony Boyle as his son Scorpius. Much like the offspring of Harry Potter and Hermione and Ron Granger-Weasley, Draco Malfoy's son is about to start his first year at Hogwarts School of Witchcraft and Wizardry. As we can see in the first photos revealed by Pottermore, Scorpius sports a head of blond hair, just like his father and grandfather before him, with J.K. Rowling commenting that "they actually look related." Anthony Boyle teased that the blonde hair was an important part of helping him get into character. "It was such a game changer. As soon as I saw it, it was like, 'Okay, I'm playing Scorpius Malfoy - this is real now." That was such a big moment. He's wearing the official Hogwarts uniform before you go and get sorted into your house. He's a Malfoy so his clothes should be really expensive but quite constraining to make him feel a bit awkward." J.K. Rowling also hinted that Scorpius Malfoy might be quite popular with the ladies when he first gets to Hogwarts, although she wouldn't offer any more story details. While Scorpius is a brand new character in the Potter universe, Alex Price's Draco Malfoy was previously played by Tom Felton in the Harry Potter movies. Here's what Alex Price had to say, when asked how he worked on making this Draco his own. "Jack Thorne's script. Start right there. And there's obviously a massive history of books to draw on. You could tie yourself in knots worrying about it. But our first job is to serve this play and J.K. Rowling's characters as best we can. The world outside has been brilliantly marshalled and been kept away from us by our producers. It's only slowly starting to rear its head now and it's intimidating, a little scary, but also very exciting because Jack is such a brilliant writer and he's taken the story into a great place 19 years later, particularly for Draco." Based on an original new story by J.K. Rowling, Jack Thorne and John Tiffany, Harry Potter and the Cursed Child is a new play by Jack Thorne, directed by John Tiffany. It will receive its world premiere in London's West End at the Palace Theatre this summer and is the eighth story in the Harry Potter series and the first official Harry Potter story to be presented on stage. Readers and moviegoers last saw Harry waving off his children at Platform Nine and Three-Quarters in Harry Potter and the Deathly Hallows - Part 2. Cursed Child will pick up the story, officially the eighth in the Harry Potter canon, after that moment. It was always difficult being Harry Potter and it isn't much easier now that he is an overworked employee of the Ministry of Magic, a husband and father of three school-age children. While Harry grapples with a past that refuses to stay where it belongs, his youngest son Albus must struggle with the weight of a family legacy he never wanted. As past and present fuse ominously, both father and son learn the uncomfortable truth: sometimes, darkness comes from unexpected places. Take a look at the latest photos from Harry Potter and the Cursed Child, and stay tuned for more as we get closer to the start of previews on June 7, followed by the first official show on July 30 in London.